Word Traveler: "Our Common Ingredient"
Hyper-conservative Baptists are not the only ones who think they’re the only ones who can be saved. Some Pentecostals, Nazarenes, Presbyterians, and so-called Independents think they are only ones doctrinally right enough to make it through the gates of heaven. If certain Christian sects had their way, the gate would be too narrow for even Jesus to get in. Yes, “the gate is small and the way is narrow that leads to life, and there are few who find it” (Matthew 7.14), but not that narrow. Open a menu at your favorite restaurant. There is only one common element. Salt. You will find a variety of tasty options but not one without salt. Take salt from your diet and meals lose their appeal. 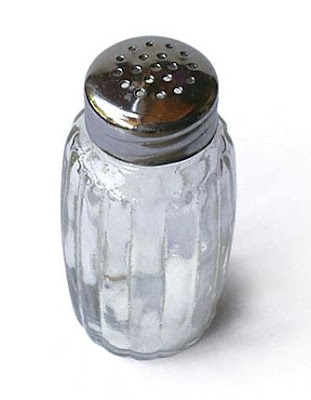 Without salt every menu item becomes drably similar. No salt, no flavor. You might as well skip the restaurant experience entirely and take your food intravenously. Remove salt and the joy of eating is gone. I assume Jesus takes great joy in the diversity of His children. Christians come in a wide assortment of flavors. Salt is what distinguishes believers and sets them apart, giving them impact and making them tasty. All those “who call on the name of the Lord” are on heaven’s menu. There is a countless variety of types of Christians. Each believer is unique. That may not be okay with some of His followers, but it’s apparently okay with Jesus. Jesus demands “salt” and “peace.” He has no plan to meld all believers into one indistinct, collective, anonymous mass. The restaurant that put all its selections in a blender and served only nutritious, unsalted protein slurpies would quickly go out of business. Jesus enjoys the variety. He created it. Jesus understands that some members of His body don’t mix well, but each menu option has salt, and that is enough. Retain uniqueness and learn to get along. Salt and peace. If that’s good enough for Jesus, it should be good enough for you.